Did you know that here in the UK it’s National Sport Week? I only know because there have been events at both of the children’s schools, one of which the eldest-and-newly-a-teenager gave us permission to attend. “Permission!” I hear you snort. I know, sigh, but it’s an improvement on last year. Last year I didn’t even get to find out that it was happening let alone negotiate our discrete attendance. And it was discrete, new-teen did wave from the other side of field as he took his place in the 4 by 100 metres but we didn’t actually meet or speak or (horror of horrors) partake in any public display of affection. What, if anything, has this to do with all things hand-made? Well, whilst I was ever-so-discretely spectating I was wearing my new long sleeves, the ones that I made for The Secret Sporty Thing. 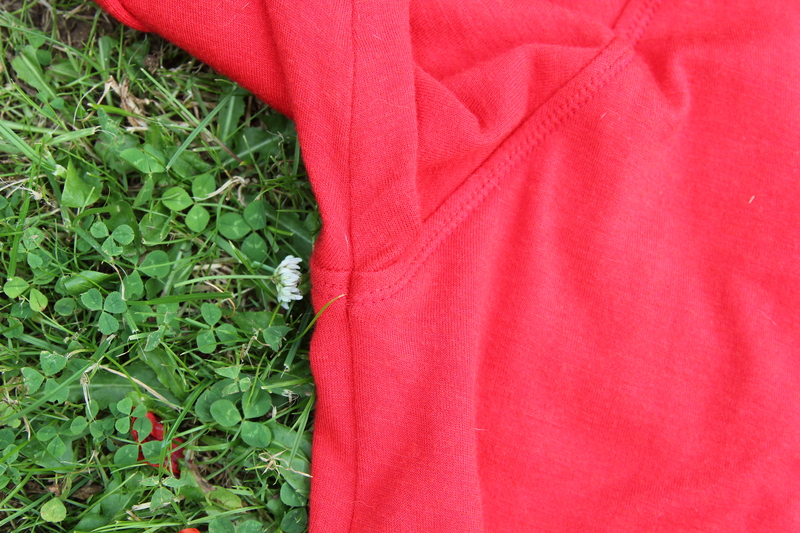 I’m not going to reveal any more about the The Secret Sporty Thing until the day of the Sporty Summer Sewathon. 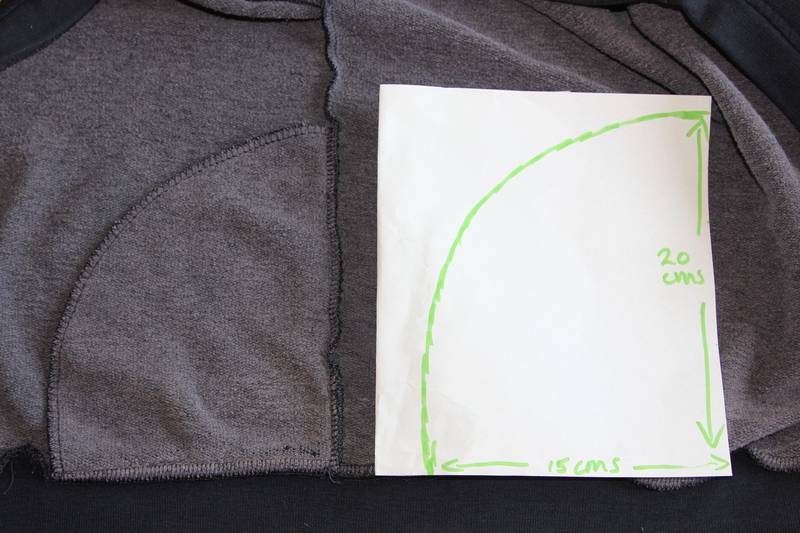 I am however going to reveal the sleeves, and the rest of the top, because making isolated long sleeves might be have been a little odd. What is it? 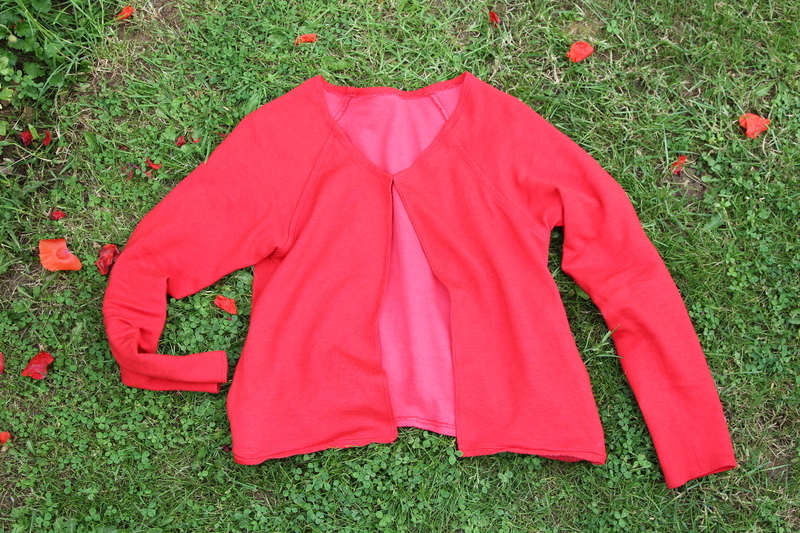 It’s a raglan sleeved cardigan affair. 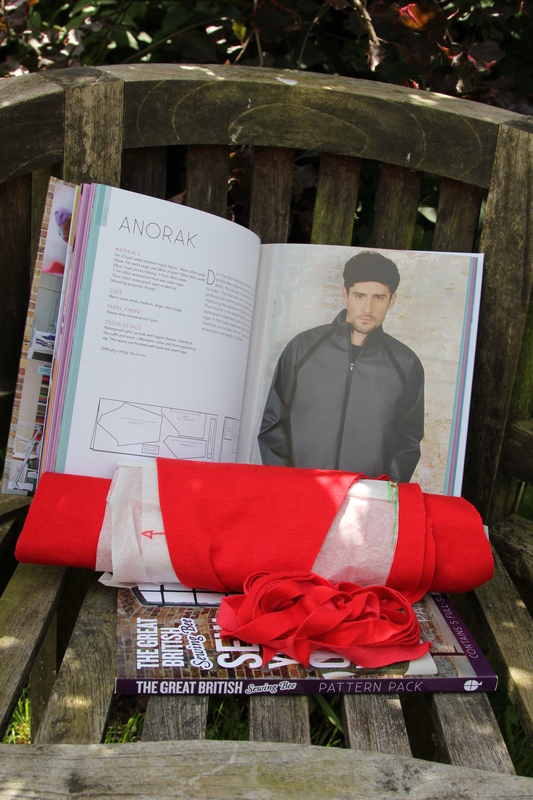 The pattern is based upon The Anorak from the book that tied-in with second series of the Great British Sewing Bee – ‘The Great British Sewing Bee: Sew Your Own Wardrobe’. It is possible to download the patterns from this book but I have my own copy so I traced off the pieces that I needed and I started to think and to fold. 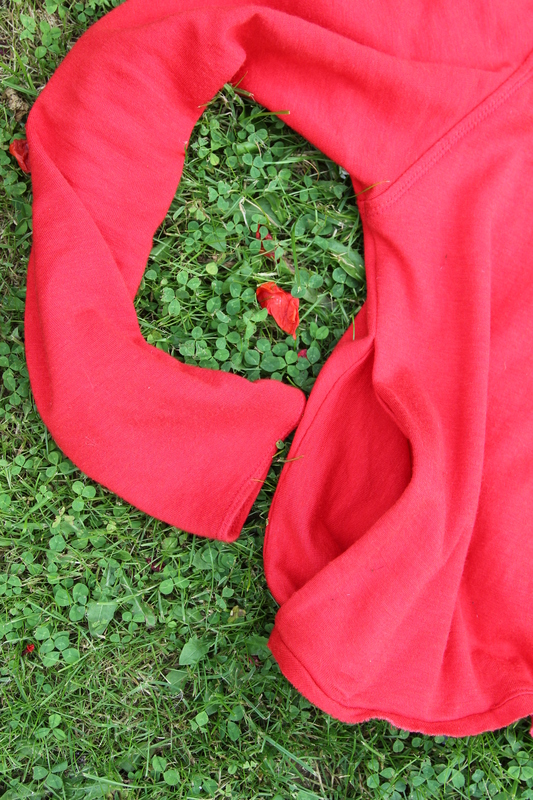 I love raglan sleeves and I wanted to try to create a pattern that would work with stretch fabrics such as this delicious, red, double sided, wool/viscose jersey from Stone Fabrics. I won’t list all of the hacking details, if anyone is interested, I’ll do a separate post. 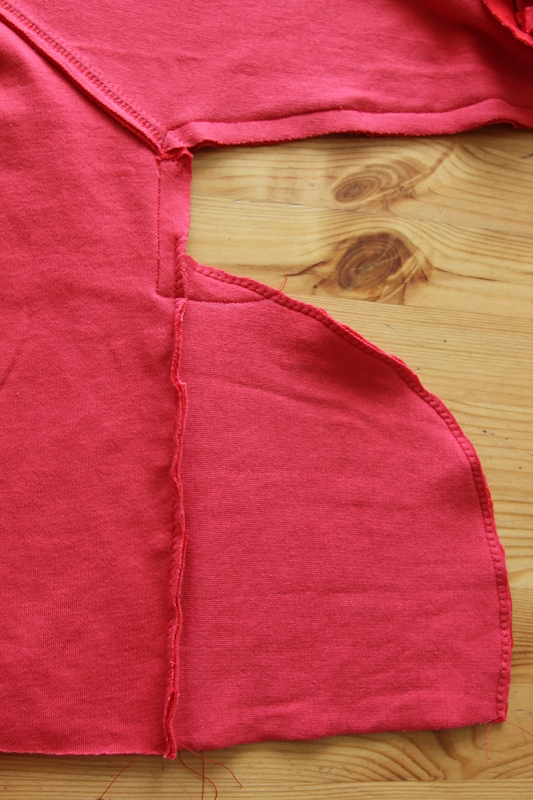 It was basically a sliming of the back, front and sleeve pieces with the sneaky insertion of pockets copied from youngest’s school cardigan. It’s far from perfect, but it is wearable. Slowly, slowly my relationship with knits is mellowing. I’m going to leave you with some actions shots – lest you fear me a complete spectator and all round lardy-arse. This is a top for watching and participating, if only there was a yoga section of Sports Day. * From Sew Essential, which I mention as it’s taken me a while to find a place that sells such delights. Previous Post What to make for a Sporty Summer Sewathon? A participant/spectator dichotomy. Next Post Finding beauty in the discarded. Ooo so you’re so good at being secretive, I just couldn’t wait! Loving the bright red, really summery. Thanks! I’m a sucker for red and as happy coincidence would have it red is new-teen’s house colour. I was therefore both a discrete *and* a specially dressed supporter! That’s a lovely GBSB anorak. You couldn’t have picked a better colour for a poppies photoshoot and it looks great on you. A very fine feline you’ve got there too! Ah, thank you very much, the cats rarely miss a photo opportunity! Pingback: Lost In Translation | Did You Make That?